On May 15, 1965, 50 years ago, one of the most influential rock-songs ever, „Mr. Tambourine Man“ (originally written by Bob Dylan) performed by The Byrds entered the U.S. Billboard charts and peaking No.1 on June 26! (See Footnote). Some weeks later, on 28.07.1965 the single also hit No.1 in the UK-charts. The Byrds, founded in 1964 in Los Angeles by Roger McGuinn, Gene Clark and David Crosby, merged the very popular sound of the Beatles with the classical repertoire of American Folk, which they had all played before 1964 in different other bands. They were especially interested in material of Bob Dylan, who was at that time popular as folk singer, but who had not yet „converted“ to Rock-music in 1964. Both, the Byrds and Dylan respected each other and so the Byrds used a number of Dylan songs on their first two albums and also made Dylan interesting for listeners of classical Rock. Later on in 1965, Dylan also used Rock-arrangements for his songs (as on „Like a Rolling Stone“). Their first hit, Mr. Tambourine Man – a psychedelic Dylan Song with subtle anti-war lyrics – was recorded in early 1965. The song was partly recorded by session musicians, because the Byrds at that time were not very experienced in studio recording and also had a rather poor live performance (you can guess from some of their early videos on youtube…). Producer Terry Melcher had a strong influence on the band on those records and he also strongly contributed to the success of the first albums. Finally the single „Mr. Tambourin Men“ appeared in April 1965, entered in the US Billboard Top 100 Charts on May 15, 1965, and finally became No.1 on June 26, 1965. The Album „Mr. Tambourine Man“ was also a huge success and has been still regarded by critics as on of their best album and included other Dylan Songs (e.g. „Chimes of Freedom„) but also some songs from band members. So now why was their music style and especially Mr. Tambourine Man such a success: With the electric Rickenbacker 360 12-string guitar, a heavy bass and sophisticated voices arrangements, the Byrds adopted the Beatles sound and created a unique Rock-style, which was called „Folkrock“. However, the founding element of the Byrds sound is the special „jingle-jangle“ guitar-sound of the electric 12-string Rickenbacker, which was introduced by the Roger McGuinn and which we can still find in many more recent songs. If we nowadays listen to early Rock’n Roll of the 50ties and 60ties and even to the early Beatles records, the sound is still far away from Classic Rock style, which is still used nowadays. So to me, it is also an interesting question, who invented the „Classic Rock“-sound and produced the first „Classic Rock“-song ever. (A bit philosophical, I know, however, I like the idea of the first rock song…). The answer is probably something in between „Ticket to Ride“ or „Help“ from the Beatles, „I can’t get no satisfaction“ of the Stones or „Break on through“ (or other songs) from the Doors debut album. There are a few other candidates to it, however, to me „Mr. Tambourine Man“ would surely be another top-candidate for the „First Classic Rock Song“ during the sixties. Following their first hit, the Byrds strongly influence many other Bands during the mid-1960ies until today. The Byrds and the Beatles met in Summer 1965 in L.A. and the Beatles first adopted the typical Byrds-sound on their „Rubber Soul“ of late 1965: On the song „If I needed Someone“, the guitar-Intro of George Harrison is exactly the same as on the Byrds song „Bells of Rhymney“, which originally was a traditional Welsh Folk song, brought to the audience by Pete Seeger („Bells of Rhymney„). In 1965, also Simon & Garfunkel had their first big single hit with „Sounds of Silence“. This original folk song of Paul Simon, which was never a success in the acoustic version, was in 1965 overdubbed with guitar, bass and drums mainly played in the Byrds style. And this rock version became the first no.1 hit single of Simon & Garfunkel and also initiated their career. Also other bands introduced elements of the Folksong style and a list of bands adopted Folkrock like Lovin’ Spoonful, Buffalo Springfield, Jefferson Airplane, The Mamas and the Papas, and finally also Neil Young. But the inspiration of the Byrds lasted until nowadays. In the late eighties, the sound had a great comeback: R.E.M. borrowed their typic sound in their song „The One I Love“ 1986, Tom Petty used elements of the sound, e.g. on „Learning To Fly“ and the LA’s with their one hit-single „There She Goes„. A more recent and actually a very nice and unique example of a Byrds-adoption are the Raveonettes, who strongly took the sound in „Love In A Trashcan“ of 2007. In October 1965 their second big hit single, „Turn Turn Turn“ was released and became their second No.1-Hit. After a year with a lot of political frictions, unrest and conflicts in the USA (Martin Luther King was killed, the Vietnam war became big), the song met the spirit of the time. And again, the band picked up a classical Folk song from legend Pete Seeger (here with Judy Collins) and combined it with their folkrock sound. And also here, the album „Turn Turn Turn“ was a chart success, even though it was perceived by critics as weaker then it’s predecessor. In 1966, their third hit appeared, „Eight miles high“, a psychedelic song inspired also by Ravi Shankar and John Coltrane. And although ignored by many radio station because of alleged drug-messages, the song became very influential at this time. But their third album „5th Dimension“ was though interesting not such a success. Unfortunately, Byrds front singer, Gene Clark suffered from flight phobia and exhaustion and left the band after two years in early 1966. This was a great loss, since he strongly contributed to the songwriting of the group and he was also a charismatic lead-singer. Gene Clark directly started a solo-career in 1967, but with less success than his colleagues. He died in 1991. In late 1966, the group brought out „Younger than Yesterday“. The record (which is one of my personal favourites!) is still regarded by critics as a very strong album, but, it was not able to compete with the other big albums of the year 1967, with cutting edge records like „Sgt. Pepper“ of the Beatles and also the Doors’ and Jimi Hendrix’ both first albums. The album contained „So You Want to Be a Rock ’n‘ Roll Star„, which also was a single in Jan. 1967, another Dylan Cover „My Back Pages„. In 1968 also Michael Clark left the band and with this the first period of the Byrds ended. With the introduction of guitar player Graham White, the new singer Gram Parsons, who also played guitar and keyboard, and a new drummer Kevin Kelley, the band substantially changed their sound. At this point, the music became more country-influenced and therefore for me personally less interesting. However, the band was still creative. In 1968, they went to Nashville, the heart of US country music and also a „No-go“ for hippies at that time and they recorded „Sweetheart of the Rodeo“. It is quite interesting listening to band-members telling the story, how it was entering the heart of „rednecks“ and how they had to hide in the studio, because some big country star was not supposed to see them in the entry hall of the Columbia records building in Nashville. It must have been a rather stony way and the outcome was not as successful as it was in the case of Bob Dylans „Nashville Skyline“ or Neil Youngs „Harvest“, both also recorded in Nashville. The album „Sweetheart of the Rodeo“ is discussed very controversial by critics. The first song „You Ain’t Goin‘ Nowhere“ (another Dylan cover) is of course a classical Byrds song, but the general idea to incorporate country music and go to Nashville finally did not pay off. Within the band, there were again a lot of conflicts between Parsons and the rest. So Gram Parsons left the band in mid 1968 and formed new bands, which were not successful. He died a few years later in 1973 after several alcohol and drug problems. 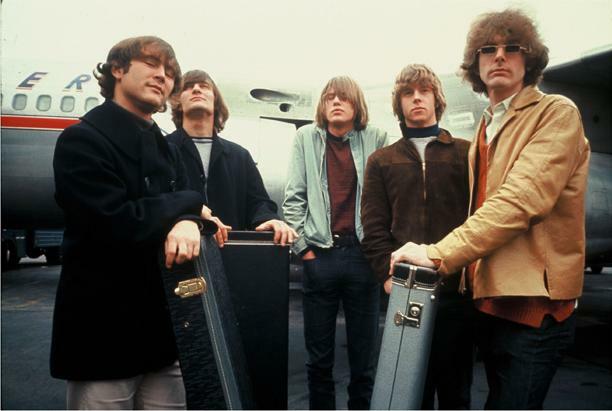 After the intermezzo of Gram Parsons, the third reincarnation of the Byrds was founded in July 1968 with Roger McGuinn, Clarence White, Gene Parsons (not related with Gram), Chris Hilman was founded. Especially the new guitarist Clarence White was important for the band, since he introduced a more powerful and sophisticated guitar-style into the Byrds music. He was also a very good performer, which also changed the whole appearance of the band on stage. The Byrds are a band of continously changing personal: After Hilman frustratedly quit in September 1968 (he was replaced by John York and lateron by Skip Battin), this third incarnation still lasted until 1972. During this period, the Byrds became good live performer and toured a lot. Their first record, „Dr. Byrds & Mr. Hyde“ was not such a success. From this first period 1964, existed some unreleased material of the band (e.g. „Here without you„), which also documents the development of the classical Byrds sound. This material was released almost at the same time in 1969 as „Byrds Preflite“ and it was much more successful than „Dr. Byrds & Mr. Hyde„. In 1969, the film „Easy Rider“ of 1969 made the band successful again: The band was asked to contribute to the soundtrack, which became finally the album „Ballad Of Easy Rider“. The material was not brand new, it also contained some older material „I Wasn’t Born To Follow“ (also from Gerry Goffin and Carole King) and the new „Ballad Of Easy Rider“. On the film-soundtrack, McGuinn is also interpreting „It’s alright ma (I’m only Bleeding)“ of Bob Dylan, but it’t not on that record. Overall, this record was was a moderate success (No. 36 in the US) and kept the band in the public awareness. In 1970 they released „Untitled“, which was also a moderate success (No 11 in UK), which contains one of the late songs I like most: „Chestnut Mare“. However, despite their good live performance in the following two years, their two last records weren’t so influential anymore. They produced “Byrdmaniacs“ (1971) and „Farther Along“ (1972), which were not so well perceived. If you like, there are some good live-albums, which were released later on, from that period (e.g. „Live From Holland“), but the sound is already far away from the classical Byrds-style and more a typical hippie-country-rock sound of the seventies. In 1973, Roger McGuinn (after a number of conflicts) managed to organise a reunion of the original five members. 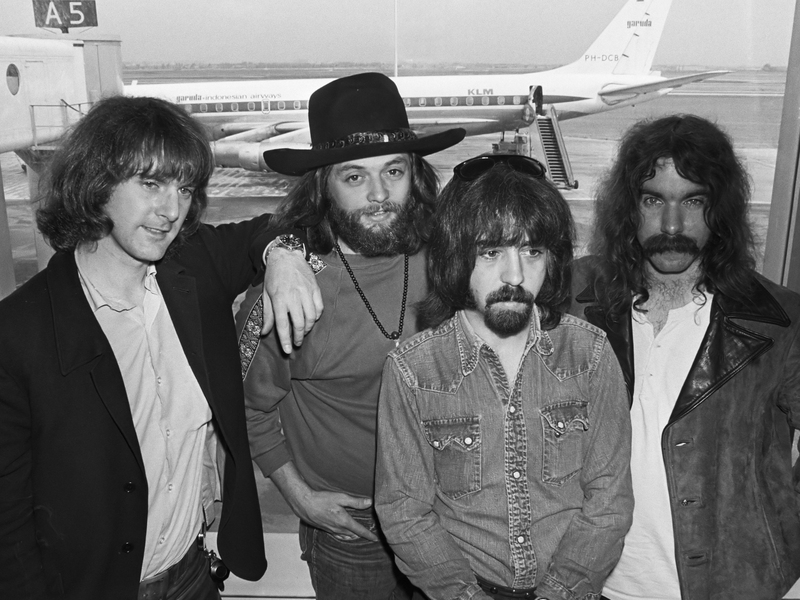 Finally, after a last reunion-album „The Byrds“, all members agreed to resolve the Columbia-contract and on not using the name „The Byrds“ anymore. Clarence White unfortunately died with a car accident 1973. Most of the members are active and especially Crosby, Hilman and McGuinn remained successful as solo performer and the reunified every once in a while. And especially Roger McGuinns record „Back from Rio“ was a very successful comeback in 1991 one with two hit-singles. But also the late folk-career of McGuinn is remarkable. He discovered the new option to make folk popular via internet, his website Folk Den is still online, so have a look there! He recorded tracks with colleagues, mainly some classical folk songs, he produced MP3-files and offered them for free on the internet. In 2001, he summed up a lot of those songs in a CD: On the record „Treasures of Folk Den“ of 2001, he collaborates with folk-legends like Pete Seeger, Joan Baez, Judy Collins, Eliza Carthy or Tommy Makem. And I can also strongly recommend the also his live record „Live from Spain“ from 2008, which is a very good one showing, that he can still do very attractive solo live-performances. So congratulations to Roger McGuinn and colleagues for their historic contribution and phantastic rock songs! It might be a good season to remember and have a new listen to The Byrds oeuvre. And as always on this site, comments, critique and questions are always welcomed! In a previous versions of this article, I had May 15 as the date of No.1, however, I guess that was wrong. The single entered Billboard Hot 100 on May 15, 1965. Some Wikipedia articles are misleading in that respect. I found diverging dates of the No.1-peak of „Mr. Tambourine Man“. However, on the Billboard website, it says June 26, 1965 and I would trust that more. Sorry for the wrong information in the previous versions. You can find a short snapshot from the Ed Sullivan-Show of „Mr. Tambourine Man“ , but that is a playback. A true live performance of the song on TV is here, however, it is probably also a real-life performance: „Mr. Tambourine Man„. I am familiar with the Byrds songs and history for a long time now, so I can’t exactly tell, where I got many details from. However, in this article, I used a lot of precise background-info (dates etc.) from the excellent and detailed wikipedia-page on the Byrds. There is also a very good documentary on the history of the Byrds, (which is a „must“ for other Byrdmanics like me): „The Byrds under Review“. Adieu Kumpan, Franz Josef Degenhardt! Wenn ich diese Bilder sehe, bekomme ich eine Gänsehaut! Mit Franz Josef Degenhardt ist am 14.11.2011 ein ganz großer Liedermacher, Dichter und ein politisch streitbarer Geist der alten Bundesrepublik Deutschland gestorben. Ich möchte einen Augenblick inne halten, weil es für mich eine Zäsur ist. Franz Josef Degenhardt habe durch ein Liederbuch kennen gelernt, „Wölfe Mitten im Mai“. Die erste Platte, die ich irgendwann nach 1990 geschenkt bekam, war „Spiel nicht mit den Schmuddelkindern“ (1965), kurz darauf „Wenn der Senator erzählt“ (1968). Und trotz des damaligen zeitlichen Abstands von 25 Jahre war der Geist dieser Platten für mich sofort zu erkennen: utopische Kunst, Satire und geistige Opposition. Die Liedermacher-Karriere des Dr.jur. Degenhardt beginnt mit der Platte „Rumpelstilzchen“ (1963), einer utopischen Deutung des Märchens. Am Bahndamm bauen Kinder ihre Höhlen, weil sie sich nicht nach Hause trauen. Hier weht der Wind durch tote Autos und der bucklige Oskar, wenige Jahre zuvor von Günter Grass erst erschaffen, schlägt die Trommel. Die Platte enthält einige solcher Bänkelsang-artige Lieder, die jedoch immer leicht ins utopische und absurde abdriften. Doch während das radikal Politische am Anfang seiner Liedermacher-Karriere sehr subtil daher kommt und vor allem von geistiger Opposition geprägt ist, jedoch ohne feste Richtung, wird Degenhardt mit der Platte „Väterchen Franz“ (1966) deutlicher. Das subtile wird weniger, die Texte gewinnen an Schärfe, zunächst nicht zum Nachteil. Denn auch seine Poesie ist dicht, gerade auf der „Väterchen Franz“-Platte, etwa im Lied „Umleitung“ oder „Spaziergang„. In „Feierabend“ skizziert er bereits 1966 den Amoklauf, den die RAF wenige Jahre später in die Tat umsetzt. „Diesmal, Lodenröck, dieses mal da lauern wir…„, hier spricht nicht nur Zorn auf die verkrusteten Verhältnisse, sondern auch ein Gefühl der Macht- und Aussichtslosigkeit, das sich in die Gewalt Bahn bricht. Und doch ist alles poetisch überzeichnet, immer fliegen auch Mauersegler durch seinen Lieder, man kann diese Lieder stets als Gleichnisse oder Utopien hören. So in den „Guten alten Zeiten„, ein Gleichnis auf die Nazi-Zeit, humoristisch und absurd. will aus meiner Kehle flieh’n. Deutschland 1968, eine geistig immer noch zerstörte Kulturnation. Der zerstörerische Wer der Nazis wirkt weiter fort, die alten Lieder wurden im Dritten Reich missbraucht, das Volksliedgut ist nachhaltig diskreditiert. Degenhardt ist der Aufbauhelfer einer eine neue, authentischen Liedkultur, des neuen Folksongs in der Tradition der Burg Waldeck. Aber auch das neue politische Lied möchte er aufbauen. 1968 ist er mit dieser Haltung wahrscheinlich ganz nah am Zeitgeist. Doch der Senator von 1968 ist auch ein Wendepunkt, künstlerisch gesehen, denn etwas geht in diesem Jahr verloren. Die Platte das „Jahr der Schweine“ (1969) kurz darauf, ist aggressiv, düster und den Liedern fehlt auf einmal die künstlerische Leichtigkeit, die sein Werk vor 1968 kennzeichnen. Man mag über die „Befragung eines Kriegsdienstverweigerer“ (1972) schmunzeln, auch dieses Lied trifft den Punkt und wird von über 50jährigen als wichtig beschrieben. Und doch fehlt den Liedern auf einmal das Utopische, die Leichtigkeit der früheren Lieder. Merkwürdigerweise… In dieser Phase, 1971 wird Degenhardt aus der SPD ausgeschlossen und später dann der Eintritt in die DKP, der SED-Aussenstelle West. Konsequenterweise kommt seine Affinität zur DDR hinzu, was ihm viele Undogmatischen verübeln. Sein allzu lautes Lob der DDR-Führung zur Ausbürgerung Biermanns aus der DDR im Nov. 1976 ist dazu passend. Sein Können blitzt nur noch manchmal auf, etwa im „Winterlied“ von 1979. Der Wind hat sich gedreht im Land. Seine späteren Platten sind für mich merkwürdigerweise überhaupt nicht mehr interessant, was offenbar auch anderen so geht, siehe sie Besprechung seines Werke von Klaus-Peter Klingelschmitt in der taz vom 16.11.2011 (http://www.taz.de/!81974/). Ein treffender Nachruf kommt von Ulrich Greiner in ZEIT Online (http://www.zeit.de/kultur/musik/2011-11/degenhardt-nachruf/komplettansicht). Und am Ende werden doch viele seiner frühen Lieder bleiben. Adieu! Es ist kurz gesagt die beste Platte, die Biermann je aufgenommen hat. Der biografische Hintergrund muss nach Auskunft von Biermann wohl ein ähnlich spannungsreicher gewesen sein, wie die Lieder dieser Platte. So beginnt es mit der euphorischen „Grünen Schwemme“, eine Lied, das bereits in den frühen 1960er Jahren entstand. Dann das fröhliche „Frühstück“ mit seiner damaligen Geliebten Tine. Der „Schwarze Pleitegeier“ als für die DDR politisch korrekter Spottgesang auf die Botschaft der BRD. Dahinter steckte jedoch auch die indirekte Botschaft, dass Biermann trotz aller Widrigkeiten die DDR nicht verlassen wollte. Die Stimmung schlägt um im „Einschlaf und Aufwachlied„. Doch zum Punkt kommt sein gesamtes Werk in der „Bibelballade„, angeblich eines der Lieblingsliedern Heinrich Bölls. Nie war Biermann so zornig auf den Staat, der seine Bürger ausspionierte, nie war sein privates so politisch: Die Stasi hatte sich in Biermanns Beziehung eingemischt („Liebesverhältnisse, die bestehen, zerstören„, so die Stasi-Diktion) und die Liebenden auseinander gebracht. In dem Lied berichtet er davon. Musikalisch ist dieses Stück dem biblischen Sprachduktus angepasst, die ganze Rastlosigkeit des zweifach privat und politisch betrogenen springt über die Gitarrensaiten. Hier schleuderte Biermann die ganze moralisch Kraft von Wort und Gitarre dem Regime entgegen. Und in dieser Betrugssituation manifestiert sich das Verhältnis des Unrecht-Staates zu seinen unangepassten Bürgern. Wie weitermachen nach einem solchen Lied? Die Lieder, die auf der Platte folgen, fallen nicht dagegen ab, sondern atmen wie die „Elbe bei Dresden“ und das „Steine-Lied“ die Intensität dieser zweifachen Enttäschung nach. „Kukuck Kuckuck“ ist große Kleinkunst. Und es gibt wenige Lied, die wie „Bin mager nun und fühle mich“ ein ausgebrannt-sein so auf den Punkt bringen. Der politische und private Kampf gegen den übermächtigen SED-Staat konnte für Biermann zu diesem Zeitpunkt nicht mehr gewonnen werden. Der angebliche „kulturpolitische Frühling“ unter Erich Honecker Anfang der 1970er Jahre hatte sich schnell als Farce entpuppt. Die DDR war immer noch derselbe repressive Staat vom 11. Plenum des ZK der SED vom Dezember 1965, der Schriftsteller wie Wolf Biermann das Schreiben und Singen verbot und den Film „Spur der Steine“ von Frank Beyer nach 2 Wochen aus den Kinos verbannte. Der Schriftsteller Werner Bräunig wurde auf dem Plenum für seinen Roman Rummelplatz scharf kritisiert und in den folgenden Monaten wurde vom Neuen Deutschland (ND) und der Parteiorganisation FDJ eine Hetzkampagne gegen den Schriftsteller organisiert. Bräunig ging an diesem Konflikt zu Grunde, er konnte kein weiteres Werk beenden und starb 1976.
am Ende der Platte lässt dies nicht nur für das Private vermuten. Und doch konnten sich Biermann und viele andere bekannte und unbekannte Oppositionelle 1989 gegen das DDR-Regime durchsetzen. Dass seine Ausbürgerung im November 1976 zu einem Brain-Drain führte und von vielen als der erste Schritt zum Zusammenbruch der DDR gesehen wird, ist von geradezu marxistischer Dialektik. Und am Ende ist es doch einfach nur eine sehr sehr gute Platte, die man noch 36 Jahre später hören kann. In der Regel ist Apple sehr erfolgreich in der sparsamen Ankündigung von technischen Innovationen, die dann für teures Geld an anspruchsvolle Nutzer verkauft werden können. Diverse Male hatte Apple für sich in Anspruch genommen, Dinge „revolutioniert“ zu haben. Egal ob der Apple II, Macintosh, iMac, Mac OS X, iPod, iPhone oder iPad. Die Liste der innovativen, benutzerfreundlichen und teuren Geräten ist lang, und meist hatte Apple die Überraschung auf seiner Seite, denn Innovationen werden idR. streng geheim gehalten und selbst eingefleischt iT-Journalisten und Apple-Experten müssen spekulieren und liegen manchmal auch daneben im Erraten von neuen Produkten vor ihrer Vorstellung. Die Mexikanische Version von iTunes hatte es bereits um 15.45, den Gesamtkatalog der Beatles, und auch der Deutsche Store kam kurz vor 16 Uhr mit allen Alben (für 12,99 €) und einem Gesamtkatalog (für 149 €). Pikant daran, dass Apple Corps ltd., die Plattenfirma der Beatles und Apple Computer sich seit den späten 70er Jahren rechtlich bekriegt und einige längere Rechtsstreite ausgetragen hatten, wer sich nach dem Apfel benennen darf und ob Apple Computer aus Cupertino auch Musikdienste anbieten dürfte. Am Ende einigte man sich vor Gericht und die Kalifornier zahlten. 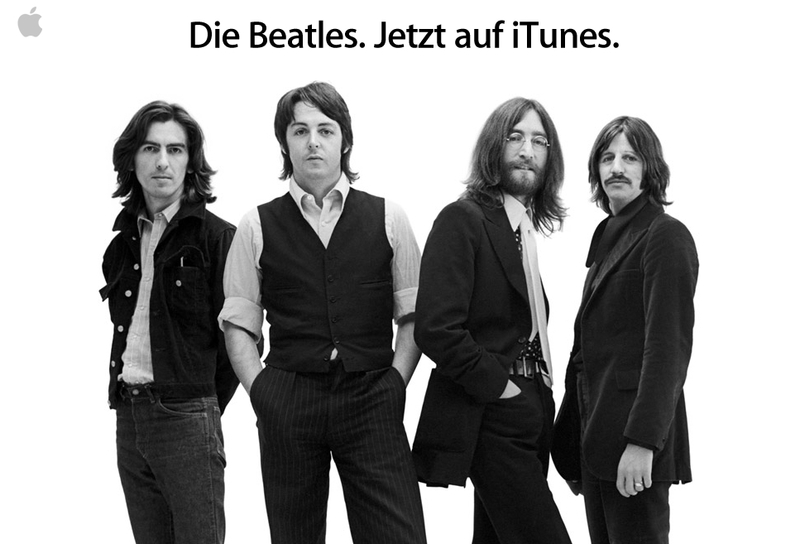 Allerdings warteten die Nutzer vergeblich auf die Songs von John, Paul, George und Ringo als .aac-Datei im iTunes Store, und das, obwohl man von Steve Jobs weiss, dass er die Beatles über alles liebt. Nach Ende des letzen Rechtsstreites, dann wieder 2009 bei Digitalisierung des Gesamtwerkes und immer wieder war spekuliert worden, und jetzt ist es soweit: Seit heute kann man sich die Songs anhören, runter laden und sich mit der besten Musik ever die Arbeit und den Feierabend musikalisch versüßen – sofern man die eigenen CDs und LPs (und Kassetten?) nicht schon lange digitalisiert hat. Am Ende des Tages überwiegt die Freude, die fehlende Klassiker in der eigenen Sammlung ergänzen zu können. Well done, Apple!